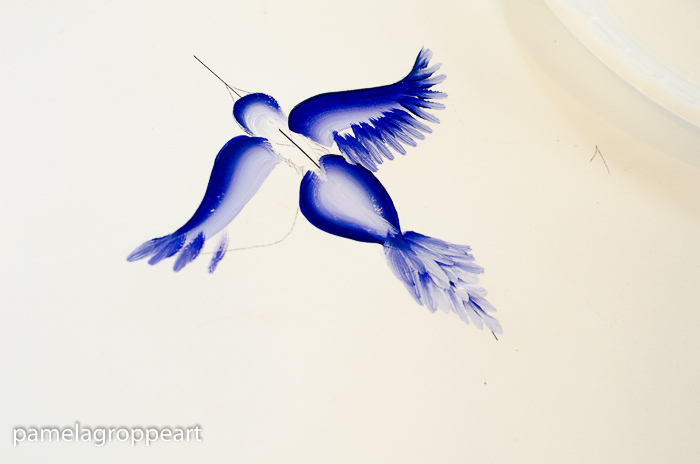 How to Paint a Blue Bird Flying. 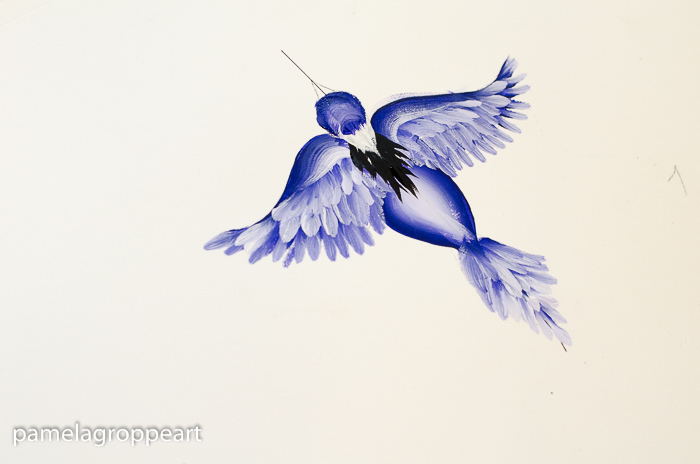 Give your design motion by painting this blue bird flying along. 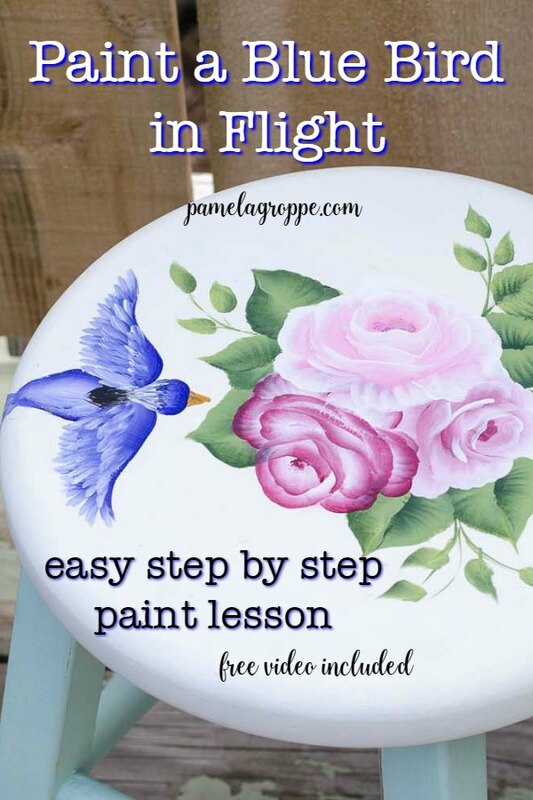 Easy step by step beginner painting lesson with video. 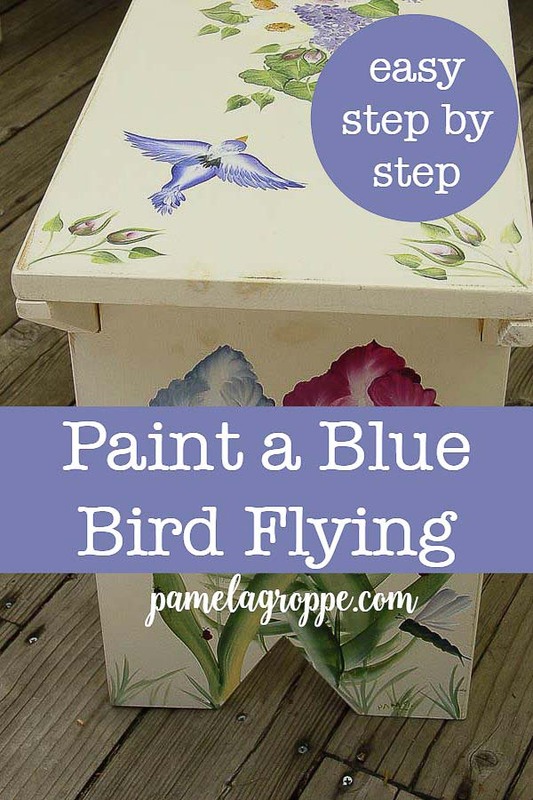 Paint a blue bird flying (or any color you wish). 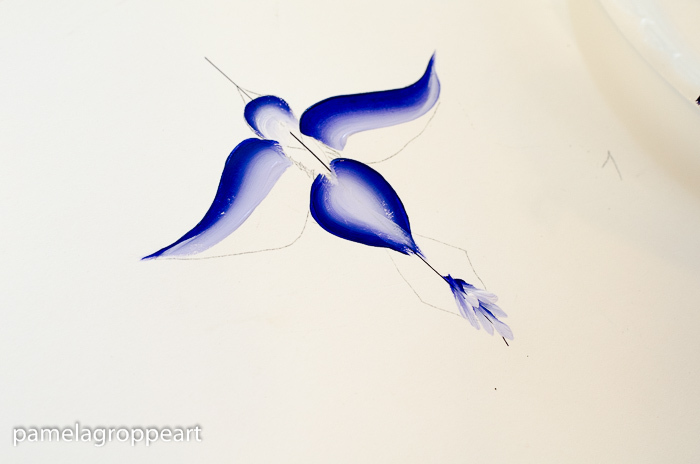 This design can liven up a painting surface by giving it motion and interest. 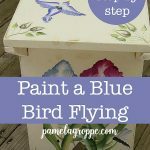 I painted this on a thrift store find, a small stool that can act as a side table or extra seating where you need it. To see the makeover go here. 1. start with your pattern, transfer it to your surface with transfer paper (not carbon paper). 2. 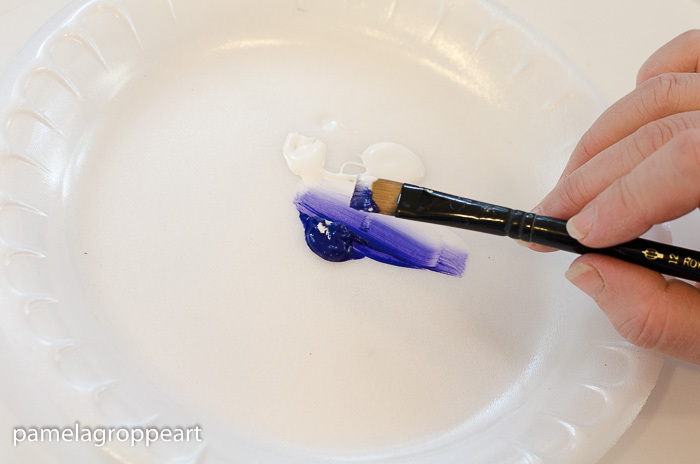 Double load your #12 flat or bright brush with Night Sky and Wicker white. 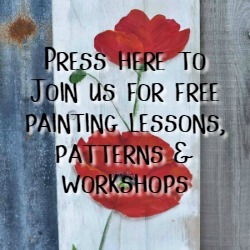 Need more info on Basics of painting like loading and strokes? Go here! 4. 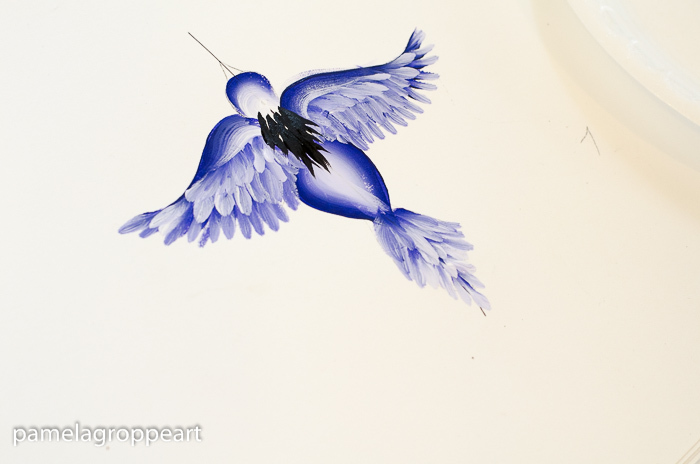 Re load your brush and come back to do the stroke on the wings. First one side then the other. 5. 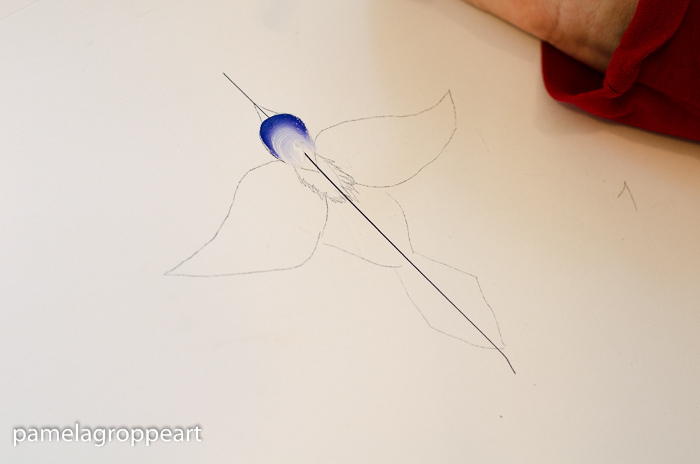 Reload the brush, stroke on the body following your pattern lines. First one side then the other. 6. 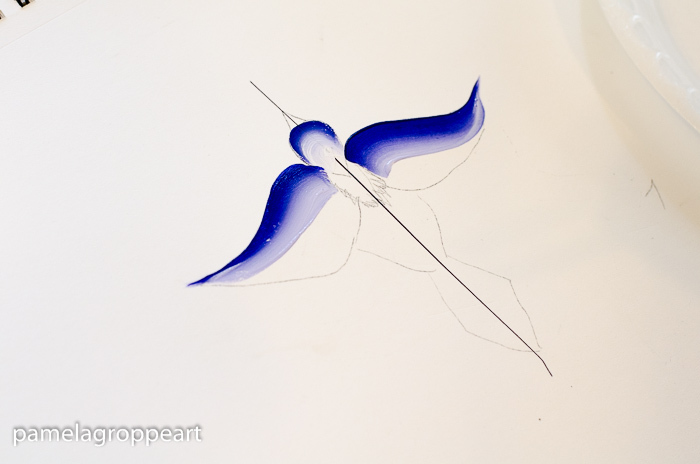 Start at the bottom center of the tail and start laying in short choppy strokes for the tail feathers. Layer your strokes as you ascend to where the body meets the tail. I got this tail a little wide once I was done adding the feathers but it still works. You can adjust to your liking. 8. 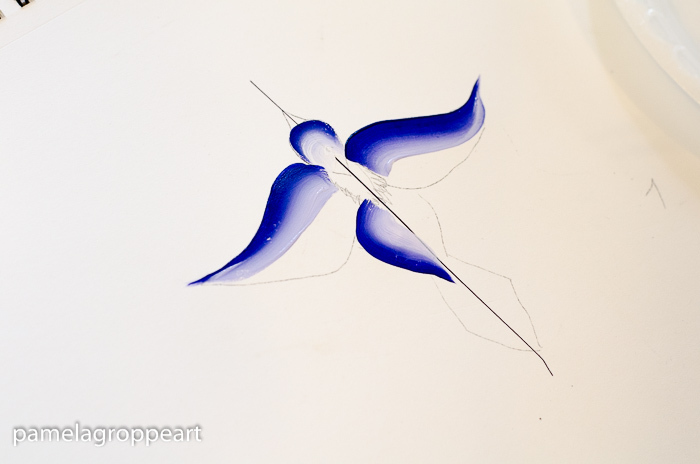 Keep layering until you reach the blue of the wing stroke. 9. Using a liner brush loaded with Licorice Black add strokes in a V shape to the back of the neck and back. 10. Next stroke the white over the black on the head. You can see how the white will overlap the black. 11. Now add the beak in Yellow Ochre and you are done! it seems no where is free from natural disaster threats. Paradise was such a sweet place. It is such a tragedy. I am sorry you lost friends, it has been a horrible time for CA. ¡QUE MARAVILLOSA PINTURA! EL PAJARO ES PRECIOSO. VOY A INTENTAR PINTARLO. ACA EN ARGENTINA, EL 21 DE DICIEMBRE ENTRAMOS EN VERANO. PERO ESTA MUY INESTABLE. LLUEVE A CADA RATO. DESPUES HACE CALOR. LA LLUVIA YA ME TIENE CANSADA, MUCHA HUMEDAD. MIS HUESOS CON LA ARTROSIS SE SIENTEN MAL. VI POR LA TELE, LOS INCENDIOS EN CALIFORNIA. ¿ TU DONDE VIVES? SALUDOS , GRACIELA. Hi Graciela, the fires are mostly under control though the long hard task of clean up is on going. I live away from the fire zone now and rains and winter have come so there is no immediate danger of fires until next Summer. I am sorry you are struggling with your arthritis, making painting difficult. One day at a time. Best Wishes. 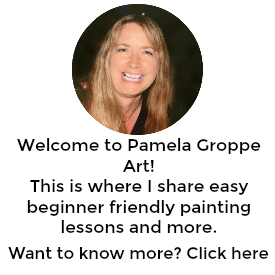 Pamela G.
Thank you once again for sharing!! Love the bird in flight! Thanks for the composition, bird and roses!